Ray Martynuik "The Can Miss Kid" passed away in Panama City this past Sunday at the age of 63. Ray played for the Flin Flon Bombers from 1967 to 1970. Ray wore no.21 and is considered one of the greatest Bomber goaltenders of all time. During Ray's three year career with the Bombers in the WCHL, he was selected as the league's top goaltender two out of the three years he played. 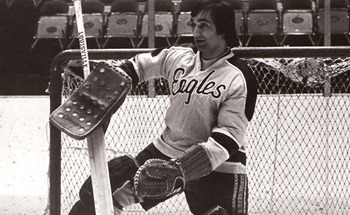 Ray was selected 5th overall in the NHL Draft in 1970, when he was chosen by the Montreal Canadiens. The legendary Scotty Bowman who managed the ST.Louis Blues at the time said Ray was one of the best goalie prospects he had seen in the last 20 years. Even though Ray did not play a single game in the NHL, he had an amazing career in the minors where he played Professional hockey for 11 years in 4 different leagues. Among the highlights being chosen the best goaltender in the Central League in 1974-75 with a sparkling 2.96 goals against average. After Ray's hockey career ended, he moved to Cranbrook British Columbia where he would work for Coca Cola for over 20 years. Ray also got involved with a lot of local charities in BC including the Children's Wish Foundation, where he helped organize a Golf Tournament every year with the Cranbrook Golf Club. Ray not only was considered one of the best to ever play his position , he is also considered one of the innovaters of the game and loved to entertain the crowd in every town he played. The next time you open up a cold can of Coke, think of the one and only "Can Miss Kid" Flin Flon's Ray Martyniuk.